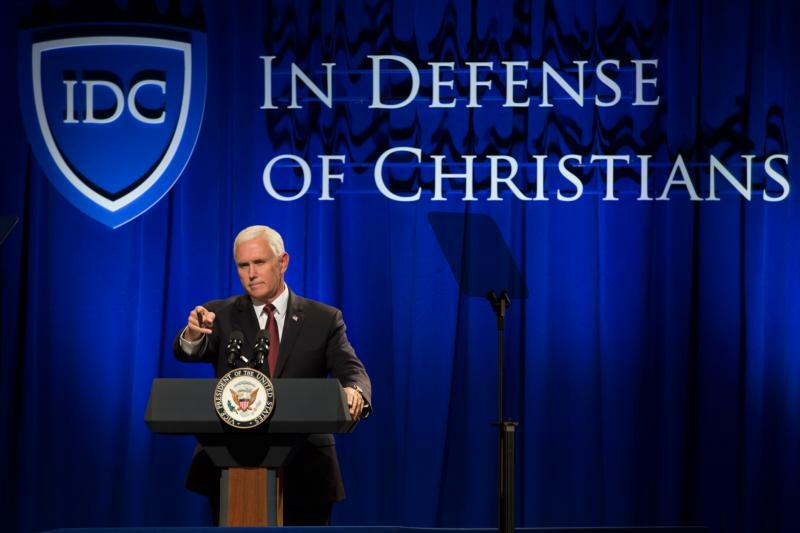 WASHINGTON (CNS) — U.S. Vice President Mike Pence criticized the United Nations’ efforts to help persecuted Christians in the Middle East in a speech Oct. 25. Since the organization “failed” to help Christians and other minority religious communities, he said, aid from the United States from now on would be routed through the U.S. Agency for International Development and “faith-based and private organizations” to help those who are persecuted in the region. “Christians and those who are persecuted in the Middle East should not have to rely on multinational institutions when America can help them directly and tonight it is my privilege to announce that President (Donald) Trump has ordered the State Department to stop funding the ineffective relief efforts of the United Nations and from this day forward America will provide support directly to persecuted communities,” he said. “I promise you one of the messages that I will bring on the president’s behalf to the leaders across the region is that now is the time to bring an end to the persecution of Christians and all religious minorities,” he said. The organization primarily aims to call attention to disappearance of Christians from their ancestral home, prompting Christians in the U.S. to do something to help them. The organization claims “over 200,000 volunteer citizen activists” in its ranks. “The vice president is correct that Christians are under particularly brutal pressure in countries where local branches of IS are active, such as Iraq, Syria, and Egypt,” said Michele Dunne, a senior associate at the Middle East Program of the Carnegie Endowment for International Peace in Washington. However, she said, “Christians have also faced persistent social, economic and political discrimination in some of these countries for decades, long before IS existed,” Dunne continued, explaining the complexity of the problems in the region. “I hope that when (the vice president) visits the Middle East, and particularly Egypt, Pence will discuss both the urgent problem of jihadi violence against Christians and the long-running problems of discrimination and intercommunal violence, about which the government of President Sissi has done very little,” Dunne said to Catholic News Service, speaking of Egyptian President Abdel-Fattah el-Sissi. “I hope he will also question whether the Egyptian government’s campaign against terrorism — which involves extensive human rights abuses and political repression — is really effective, or whether it might be fueling the very radicalization that ends up brutalizing Christians,” Dunne added. Absent from the vice president’s Oct. 25 speech was the Trump administration’s stance toward refugees from some of the countries where Christians are facing some of the violence he spoke about, including Iraq, Syria and Egypt. Though the vice president said in his speech “America will support these people,” meaning Christians and other religious minorities facing persecution in the Middle East, the day before, on Oct. 24, the administration announced stricter restrictions for refugees wanting to come to the United States from 11 countries. Though the countries were not named, news agency Reuters reported that they were mostly from the Middle East and Africa, which in the past included many persecuted Christians seeking refuge in the U.S.
“Of nearly 2,600 Iranian refugees resettled in the United States last year, for instance, a majority were Christian,” Reuters reported. In Defense of Christians, which hosted the speech, has repeatedly asked Congress that any relief for Christians in the Middle East, in terms of U.S. policy, include the admission of Christian refugees from certain nations where persecution is particularly grave. In this year’s In Defense of Christians summit policy agenda, the organization says it supports a bill that would provide immediate relief to minority religious groups in Iraq and Syria, particularly Christians and Yezidis. “These communities would receive special humanitarian status and refugee resettlement priority in the U.S.,” the organization says on its website. Most of the Trump administration’s efforts, however, have focused on allowing fewer, not more, refugees into the United States, and have sought greater restrictions for those coming from majority-Muslim countries, including some nations where Christians in Middle East are facing peril. In late September, Bishop Joe S. Vasquez of Austin, Texas, who is chairman of the U.S. Conference of Catholic Bishops’ Committee on Migration, voiced objections about the historical low level of refugee admissions under Trump, who will limit the number of refugees the United States accepts to 45,000 for the upcoming fiscal year. “These people include at-risk women and children; frightened youth; the elderly; those whose lives are threatened because of their religion, ethnicity or race; and refugees seeking family reunification with loved ones in the United States,” the bishop said.